It was the Hursley 10K today and this year the weather was a bit kinder to us. It was my turn to run in the main race and I felt pretty good as I set off out the field in second place. The guy out in front just continued to pull away and eventually finished two and a half minutes clear. I and another run exchanged places for second up until around 6k where I started to get a splitting headache. This was bad timing as I just couldn’t push myself up the hill on the gravel track. There was then a steady stream of runners passing me and I ended up finishing in 8th place. My thanks go to the runner from Lordshill who encouraged me on across the last field which meant me finishing time of 38:45 was still marginally quicker than two years ago. Still not sure what brought the headache on (it still hasn’t quite left me yet). It may have been a lack of fluids (it felt very humid and I was certainly sweating buckets at the end) or it may be the start of a cold (I’ve certainly had a sore throat the past couple of days). 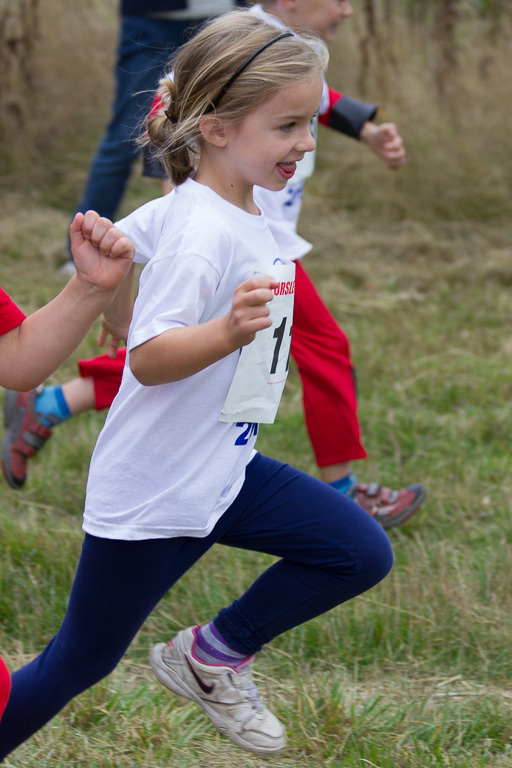 Emma was entered for the fun run and was determined to run round on her own this time. However, she met a school friend when warming up on the bouncy castle (!) and they ran round together. She had a big smile on her face at the end which is the important thing. This entry was posted on Sunday, September 22nd, 2013 at 8:20 pm	and is filed under Family, Running. You can follow any responses to this entry through the RSS 2.0 feed. Both comments and pings are currently closed.